Lufthansa CRJ900s are operated by regional airlines that are owned by Deutsche Lufthansa AG, the parent company of Lufthansa. Lufthansa CityLine and Eurowings (49% of company owned by Lufthansa) operate Bombardier CRJ900 jets for the airline. These Lufthansa Bombardier CRJ900 flight are usually marketed as Lufthansa Regional flights. The Lufthansa CRJ900s have a total of 86 seats with a business class section located in the front of the aircraft. There are 22 business class seats and 64 economy seats on board the Lufthansa CRJ900 jet. Below is a seating chart for the Lufthansa Bombardier CRJ900 aircraft. 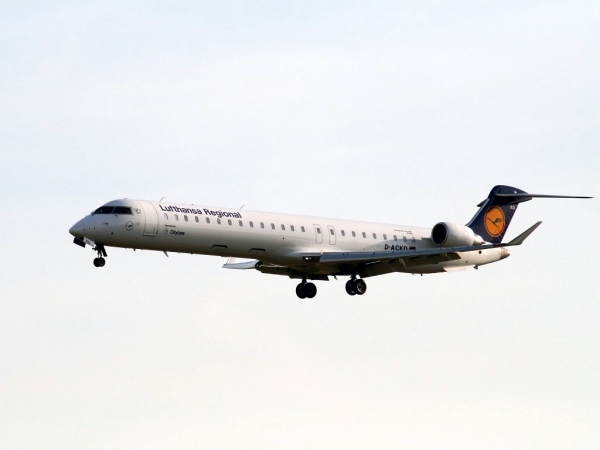 A Lufthansa Bombardier CRJ900 is also called the Lufthansa Bombardier CRJ9, Lufthansa Bombardier CR9, Lufthansa Bombardier CL-600-2D24, Lufthansa Canadair CL-600-2D24, Lufthansa Bombardier CRJ 900 or the Lufthansa Canadair Regional Jet 900 due to the various names for the CRJ900 aircraft. Above Lufthansa Bombardier CRJ900 Photo of a CityLine CRJ900 by Klever on Wikimedia Commons.